Jessica Sanders from Melbourne writes: I have been dating a new partner for a couple of months. I really want my dog to like him, but I was wondering what is the best way to introduce them without stressing my dog out? Is Your New Partner An Animal Lover? This one is pretty simple: if your new partner isn’t an animal lover, there may be reluctance to meet your animals or spend any time around them. It is possible that your partner doesn’t dislike animals but many have never lived with animals before, or may have a fear of them. It is crucial you find out how they feel about animals and how open-minded they are about spending lots of time with your animals in particular. It doesn’t matter whether they are into dogs, cats or horses, if you’re new mate isn’t into animals, then is your relationship going to work at all? Have a serious reflection on this one before beginning to introduce your animals. If your new partner is an animal lover, they have lived with animals before and they are open to following the right steps to meeting your animals, then you’re in luck! If not then you may want to consider whether this relationship is even worth starting. For those with ideal partners here is the best way to start the human/animal relationship. Your home is your animals’ home. It is their sanctuary, their security and where they get to spend the most time with you. As much as we take our animals for outings where we can, they do spend a lot of time at home. Therefore, they will be protective of their territory. It is a great idea to keep something of your partners’ in your house such as an old T-shirt or a current pair of socks so your animals can get used to their scent. Leave it in a shared space such as the living room or the bedroom so your animals can smell it whenever they want. It prepares your animals for what’s to come and it is less confronting than having someone just enter your home or moving in straight away. The time has come for your dog or cat & your partner to finally meet each other! Your dog has heard so much about your partner, and vice versa, that they will be aware of each other’s presence in your life. Here at Animal Talk we can safely say that your animals are absolutely aware when there is a special someone in your life, even before you have met them physically. Your animals can see the new person’s energy around you, and whether that person works for you or not. Have your partner and dog meet each other on neutral territory such as a dog park or in a fenced off leash area. This gives them equal footing & they don’t feel pressured to like each other straight away. Have some tasty treats with you, so your partner can practice with your dog and start bonding together. Some dogs will be all over new people. Other dogs need more time while they suss out your new person. Be prepared, your dog might just make them work hard for their approval! 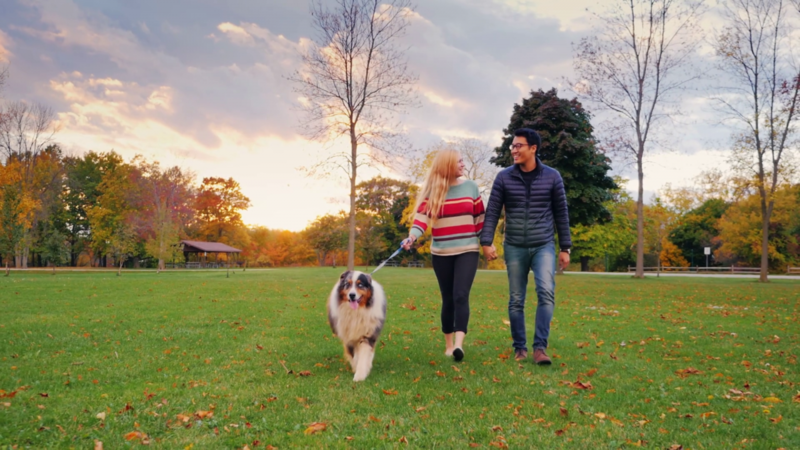 Getting your partner to come to regular park sessions with your dog will help them get familiar with each other. If it is a cat you are introducing then inform your partner to come in and sit down in the living area and under no circumstance to approach your cat. It is up to your cat to decide when it is time to get up close and personal if at all. Cats hate to be forced or restrained so the very slow approach will work best. You can even get your partner to put their favourite treat on the floor quite some distance from where you are sitting so your cat can choose whether to accept it or not without getting out of their comfort zone. Always make sure there is a door open so if your cat wants to leave they can easily and without stress. This process with your animals will take time so don’t rush things. This could be good advice for you as well. This is a pretty big deal for your animals, as the new person is now in their territory. It is important that you explain to your partner where your animals like to sit, sleep, play and try to keep those places stable as much as possible. Your animals are used to routine and this provides them with security. Changing their routines abruptly can cause a lot of confusion and distress to your animals. If your animals are used to sleeping in your bed, then this is what should continue as after all they were in your life first. It is ideal to give your animals options to sleep with and without you, as in the first instance this partner may make them feel uncomfortable. You can get them used to sleeping on the floor on a soft bed or just outside the room. They can choose. That way they don’t feel like they have been turfed out of their special place with you, because someone else is occupying their space. After all your animals are like fluffy roommates – you wouldn’t like to be pushed out of your territory would you? Many of my clients have been the situation where their cat or their dog have started strange behaviours in the home after bringing a new partner in. Some cats will spray or poo on the bed, dogs are known to hump your leg and even at times your animals will position themselves between you and your new ‘mate’. Some even show aggression. What your animals want you to know is don’t forget who was here first. Your animals have been your support system, your strength, your confidante and your shadow no matter what. A lot of animals tell me their person starts to slack off on the cuddles, playtime, outings, and overall attention. They know that as soon as that ‘new person’ showed up, they weren’t the centre of attention anymore. As exciting as it is to have a new budding relationship, try not to put your animals at the bottom of the priority list. Your animals should get just as much attention, love and respect as they did before your new person arrived. At the end of the day, if that relationship doesn’t work out, your animals will still be there to comfort you when you need it. So you have followed all the right steps to getting your animals to know your new partner. They have met gradually, they seem to get along and they enjoy each other’s company. Time to move in together! If your partner is moving into your home, it will be a transition period for your animals. Let your animals sniff and explore your partner’s belongings; it will give them familiarity about these new things in their territory. Try to keep your animals’ favourite spots and furniture unmoved, as we want to keep a routine as much as possible. This is also important for their daily routines. Maintain their usual schedules of playtime, feeding times, and outings, whilst also getting your partner involved. Have your partner feed your animals the morning or evening meal. Give them time to play together instead of with you. The more you keep it normal for your animals, the easier the transition will be. Ultimately, your animals want the best for you, so if they can see this new person makes you really happy, they will try their best to get along with them. This also must come from your partner as well, as your animals are a huge part of your life and they are not going anywhere anytime soon. If you find after time that your animals are still not warming up to your partner, you need to find out why. Booking a consultation with an Animal Talk will help to understand how your animals are feeling about this situation and what they need you to know. Previous Post Choosing A Dog: Puppy, Adult or Senior? Next Post Do You Make Your Animals Happy?